Every day websites that deal with money and sensitive data are prone to several hacking attacks. Hackers keep targeting these websites to exploit for their personal gain. So, it is important to raise the wall against such vulnerable activities and stay protected with the right set of tools at hand. In simple terms, website security check is mandatory. Compromising on website security check can put your enterprise’s reputations at stake. It is advised to check your website security on a regular basis to identify the grey areas were a hacker can easily bypass restrictions. In this blog, we discuss how to scan and check your website security for protecting it from all types of malicious approach. Over the years, hacking mechanisms have evolved with the changing trend. So, the best way to perfectly measure how secure a website is by running a website security scan. This will bring to light the weakness and security holes that need to be addressed immediately. Generally, a security scan is performed before a website goes live or possibly soon after the launch. Delaying the security scan can cause a lot of harm. Find below some efficient services that scan a website thoroughly to calculate its risk factors. A website security scan is easy to perform, simply start by keying the website address in the search box. The scanner will automatically perform checks on key areas that hackers will hunt for on your website. On gaining insights on the weakness and vulnerability of your website you can decide on the remedial part as required. 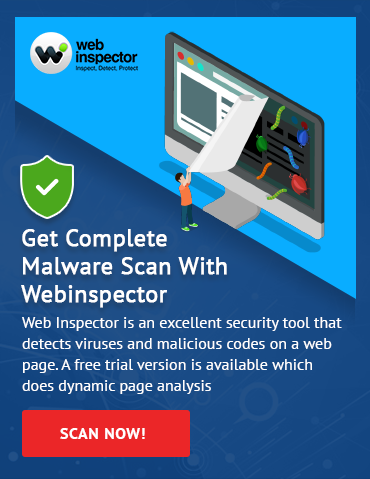 Comodo Web Inspector is a powerful website security scanner that will check on all the vulnerable areas that a hacker would use to break into your system. It offers the best-in-class malware and blacklist monitoring service for all kinds of websites. Mozilla Observatory was predominantly built as an in-house solution. However, it performed exceptionally well that the company decided to open it up to public as well. The feature- rich website scanner will check your website for HTTP Strict Transport Security (HSTS), redirections, X-Content-Type-Options, cookie security flags and much more. The online website security scanning service is free to use. Sucuri Sitecheck is yet another highly sophisticated website security scanner intended to help identify different types of malware, which includes Cross Site Scripting (XSS), User Agent spoofing, Website Defacements, Phishing Attempts and a lot more. Sucuri SiteCheck is quite the comprehensive security scanner that is worth trying. Scan My Server is an efficient security scanner that checks a website for weaknesses and other security threats. It checks SQL Injection, Cross Site Scripting, PHP Code Injection, Source Disclosure, HTTP Header Injection, Blind SQL Injection, XSS and a range of other vulnerabilities to safeguard your website from all kinds of malware attacks. These are some of the best tools available in the market to assess a website against vulnerabilities. There are many other tools that may specifically focus on a website’s security requirement. It is very important to perform website security checks using scanners these days as fraudulent activities have grown in numbers alongside the techniques. A compromise on the security front is unacceptable as it can cause serious damage to the business.